dumpandchasehockey | All hockey, all the time. Its the last game of the year. You need to win this game to make the playoffs. The game goes to a shootout. Who are the three players you give the nod to? Lets get real. This is the only reason anybody plays for the Flames these days. I am back from two weeks in the wilderness, “camping” some people may call it. It was a huge week in the NHL and I was trying to keep up with the flurry of activity via my Blackberry. But finding service as well as keeping my phone perfectly still when I found a bar proved to be a challenge. But the news I received was well worth the wait. 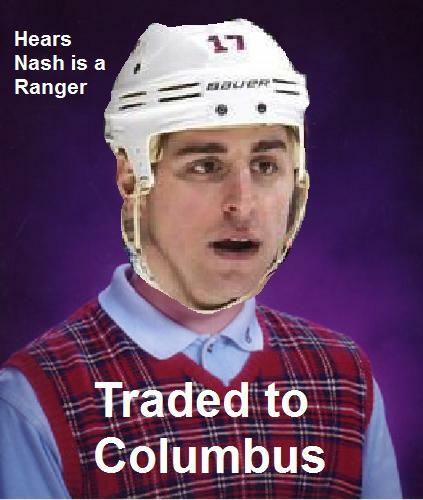 The biggest trade of the summer of Nash to Broadway went down. I also followed the saga of the biggest contract of the summer with a watchful eye. When all was said and done I was surprised, delighted and confused to see Weber back in the Nashville and the contract it took to keep him there. 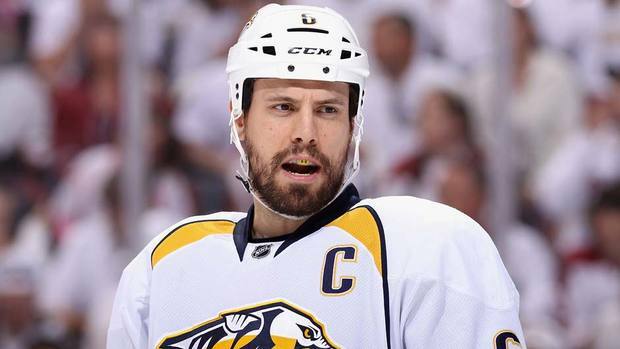 Shea Weber is arguably one of the best defenseman in the NHL. He has been a Norris trophy candidate for the past two years, is an Olympic gold medalist and is the captain of a team who likely would have never made the playoffs let alone advance past the first round if not for him. He boasts one of the hardest slap shots in the game. This year he tied Erik Karlsson for the league lead in goals for defenseman with 19 goals and led all defensemen with 10 power play goals. He is also a work horse who isn’t afraid to bang bodies or give up his own body as his 26:09 TOI/g, 177 hits and 140 blocked shots in 2012 would attest to. 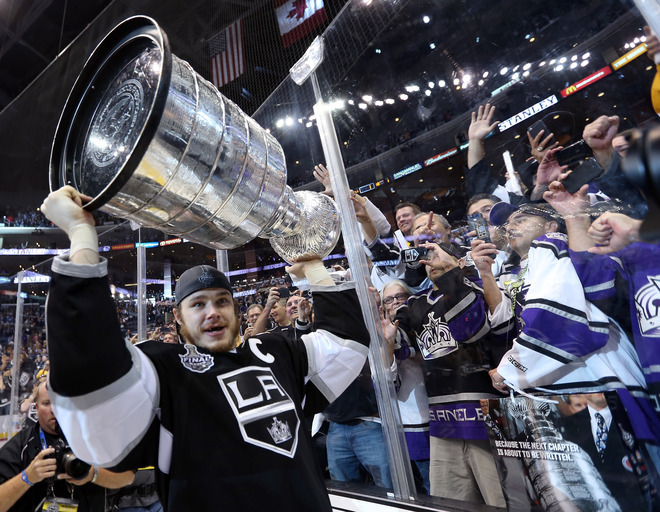 To top it off he has been named to the NHL first All-Star Team in both of the past two seasons. He has quite the track record for a man of just 26 years old. A player of his caliber is very rare so when given the opportunity to acquire one, money seems to be no object in the NHL and most sports for that matter. This is a league where the salary cap and cap floor makes the gap between a good and great team very slim as we saw with the eighth seeded LA Kings taking everybody by surprise to capture the Stanley Cup. They may have been considered underdogs by many, but if you look closer they had the 7th largest payroll in the NHL dolling out $63,671,201 to their players. So when the cap frugle Nashville Predators were having trouble signing RFA Shea Weber to a new deal, the Philadelphia Flyers rolled the dice. They offered the all-star defenseman an offer sheet of $110 million over 14 years and if the Preds had turned it down, the Flyers would have found a replacement for injured top defenseman Chris Pronger. Unfortunately for Philadelphia, Nashville matched this monstrous offer. But was it really fortunate for Nashville? Sure they lock up an elite defenseman and captain while telling a just-growing fan base “we aren’t throwing in the towel just yet”. The other star defenseman, Ryan Suter left town for Minnesota and high scoring Russians Andrei Kostitsyn and Alexander Radulov took their bad blood elsewhere. So there is now a dire need for young guns like Colin Wilson, Ryan Ellis and Jonathon Blum to step up so the Preds can contend in 2013. But more importantly they must fill the seats of Bridgestone Arena if they want to stay in the Nashville while the city of Quebec lurks in the shadows. But the sheer length of the 14 year deal has the very real possibility of back firing. Contracts of such length have a history of turning sour. The first team that comes to mind is the New York Islanders who thought that they could gain an edge in the 2001-02 season by locking up star sniper Alexei Yashin to a decade long worth $71.5 million. Yashin would only reach 30 goals once after signing this contract and was bought out by the Islanders in 2007-08 and will have to be paid by the team $2,204,000 until 2014-15 against the cap. (See Yashins full contract details at http://capgeek.com/players/display.php?id=1162 ) Also despite the good intentions to lock up the 2000 first overall pick long term, the 15 year $67,500,000 signing of Dipietro in 2006-2007 may be one of the biggest mistakes in Islanders history because of his many injuries and sub par play when healthy. These massive contracts have a tendency to eventually alienate players from their team and fans when there is any decrease in performance. We have seen this countless times, such as when the Rangers buried former superstars Wade Redden and Chris Drury in the minors to never be seen again. 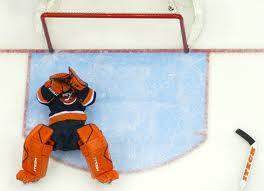 Many others from Cristobal Huet to Sheldon Souray have gone through these struggles. Roberto Luongo has been thrown under the bus for his recent lack of playoff success coupled with the sudden emergence of Corey Schneider. When you add Luongo’s massive contract to the equation, they suddenly have less teams in the mix for the 4 time all star and a fan base who can’t wait to unload the former captain. Some recent contracts with the potential to blow up are the Wild duo of Parise and Suter who are second tier players being paid like they are Norris and Hart Trophy winners. Also locking up the recently injury-riddled Sidney Crosby to 12 years has the potential to be brilliant or Yashin-like. Crosby is at a crossroads of his career where from here on out could be a Mario Lemieux, or have the wasted potential of a Lindros or Kariya. You can not possibly blame players for accepting these deals. If somebody says your worth $100 million who are you to turn it down? Instead owners and GM’s have been driving up the market with these ridiculous deals that don’t seem to benefit anything but the player’s bank accounts. CBA talks are heating up and the 10 year deal is a hot topic and it will be interesting to see who will win the clash of the greedy corporations testing the greed of the players. If things don’t start to progress further we may not even see a 2013 season. But on a brighter note congrats to Weber on a much deserved pay day! There is no cause for worry if your team hasn’t made a big splash in the free agency yet. Sure, most of the big fish are out of the water, but there are plenty of serviceable players to potential star players left in the free agent market. I’ll take a look at the top 4 remaining free agents. The number one player left in the free agent pool in Shane Doan. The Phoenix Coyotes captain has played with the Coyotes franchise since before it moved from Winnipeg in 1996. Doan is a big winger standing at 6’2 and 228 pounds and wears his heart on his sleeve while playing. In his 13 years of full time NHL duty, Doan has scored 20+ goals 11 times and is always relied on for offense and leadership. Drafted 7th overall in 1995 by the Winnipeg Jets, Doan is now 35 years old and is looking for a team with a stable ownership and a perennial Stanley Cup contender. The only reason he hasn’t signed yet is because he has not decided which of his many suitors he’ll ink a deal with. Alexander Semin is another talent who remains unsigned. The Washington Capitals forward is the most skilled player in this free agent crop (including Zach Parise). Semin boasts a dynamic skill-set that immediately makes him a focus for opposing defensemen. Talent-wise, he is one of the best players in the NHL. However, Semin has problems with motivation and often appears lazy on the ice. He has drawn criticism for not playing a 200 foot game and was benched under coach Dale Hunter when he refused to play Hunter’s defensive game. Semin was given career-low minutes in the playoffs and seems to want out of Washington. Whether or not he’ll stay in the NHL has yet to be decided, the KHL always remains an option for Russian-born players like Semin. Carlo Colaiacovo is an interesting defenseman that is still left on the market. At only 29 years of age, Colaiacovo is in his prime and still has some great years ahead of him. He is a strong third pairing defenseman or a solid second pair defenseman and can move the puck well from the backend. He can also man the point on a powerplay and has some offensive ability to go with his puck moving skills. Colaiacovo could be a great pickup for a team that is lacking some punch from the D but cannot afford any of the big names. The reason that he has not been signed yet is that he cannot seem to shake the injury bug that has been plaguing him his whole career. Never in his career has Colaiacovo played a full 82 game season; in fact the most games he has ever played in the NHL was 67 games in the 2009-10 season with the St. Louis Blues. Due to his injury problems, Colaiacovo could be had for a small amount of money and is a low-risk high-reward player. Dominic Moore is not the type of player that the fans talk about when they’re talking about their star players. He isn’t the type of player to score 30 goals or be featured on Sports Centre or ESPN. Moore is the guy who shuts down opposing teams’ star players while chipping in a little bit offensively. He is the guy who stays longer than anyone else on the ice working on his skills. Moore has been traded 7 times in his career, usually at the trade deadline to a team that is looking to improve their bottom six forwards for a long Stanley Cup run. Used extensively on the penalty kill by all of the 9 NHL teams he has represented, Moore is a defensive specialist whose role is invaluable but has not been signed yet due to his declining production in terms of offense. Memes master Jeremy is off in the wilderness for the summer so I thought I’d try my hand at it. You heard it first from Dump and Chase Hockey; Ryan Suter and Zach Parise, the biggest free agents of the year are off the market. 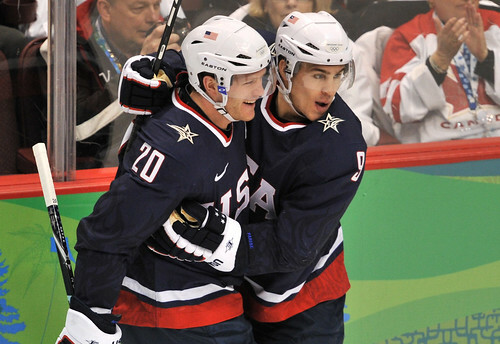 They both signed identical 13 year contracts that will pay them each 98 million dollars with the Minnesota Wild. The Wild now have both players under contract until they are 40, a long time to guarantee pay. While these two signings may be the biggest news in the NHL off season so far, there are potential trades to come this summer that could eclipse them by a long shot. Now that those two prized free agents have been crossed off everyone’s list, teams will be desperate to go after big winger Rick Nash. 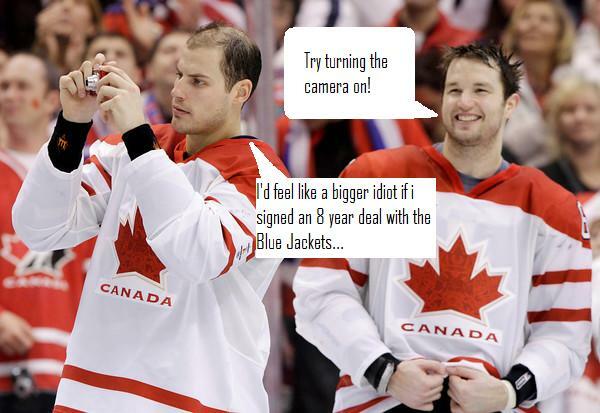 First of all is Columbus Blue Jacket’s captain Rick Nash. Nash has been the face of the Blue Jackets since he was drafted #1 overall by the franchise in 2002. The 28 year old has been loyal to his team for his tenure there, and proved that by signing an 8 year contract extension on July 3, 2009 worth $62.4 million. Taking effect in the 2010-2011 season, this contract gave Columbus fans a reason to hope. But after the dismal season that the Blue Jackets experienced in the 2011-12 season, Nash has asked for a trade and is now being shopped. The only problem is that he has a no-trade clause; therefore he will choose a destination. His short list is said to include Detroit, the New York Rangers, Pittsburgh, Philadelphia and San Jose. Detroit could really use a defenseman after the retirement of future Hall of Famer Nick Lidstrom and the mutiny of Brad Stuart to San Jose, but if the offer came up, they couldn’t turn down a premier forward like Nash. Nevertheless, Detroit is in the Central division, the same division as Columbus and it is doubtful that the Blue Jackets would like to see Nash six times a year in an opposing jersey. 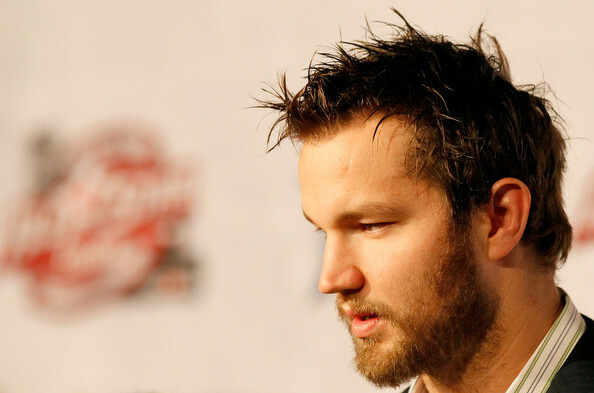 The New York Rangers are rumoured to be a favourite in the Rick Nash sweepstakes. Rangers GM Glen Sather has reportedly wanted too see Nash as a Blueshirt for a long time, and sees this as his chance to go after him. The Rangers are looking to upgrade their offense and Nash is seen as the piece of the puzzle they are missing. The only problem is that Sather seems to be unwilling to part with any of his top prospects or young talents, something that could remove them from relevance if another team is offering prospects. Pittsburgh is another destination that Nash could go to. After clearing millions of dollars in salary cap space by trading center Jordan Staal and D-man Zbynek Michalek to Carolina and Phoenix respectively, the Penguins have cash to spend. Most people thought the Penguins were clearing cap room for Zach Parise with those trades, but now that Parise is off the market, they could go hard after Nash. Philadelphia is said to be one of the teams that is less interested in Nash, but they are still in play. The Flyers could use a big body up front, and at 6’4 218 Ib, Nash certainly delivers on that front. He would also provide leadership to the youth of Philadelphia. However, Columbus Blue Jackets GM Scott Howson is rumoured to be asking for future superstars like Sean Couturier or Brayden Schenn as part of the deal. After being bounced in the first round of the playoffs this year, San Jose is also looking to enhance the skill of their forward corps. Nash is one of only four players to score 30 goals in each of the past 5 seasons. The other players who managed that incredible feat are New Jersey’s Ilya Kovalchuk, Calgary’s Jarome Iginla and Washington’s Alex Ovechkin. That puts Nash in heavy company, and he could be just what the Sharks need to break into the West’s Elite. No matter what team Nash goes to, he is going to make a difference. As my colleague Thomas wishfully says, “He could still end up as a Leaf”. But let’s get serious, do you think Burke would trade for a Canadian superstar? Seems as though Bobby Ryan would be more to Burke’s liking.